In one way or another, the question ‘How is India Doing?’ has been one of great interest down the decades, and not only from the mid-1980s when Amartya Sen wrote an article, with that title, in the New York Review of Books. The last couple of years have seen the emergence of two books (primarily) on India’s economic and social development, by Jean Dreze and Amartya Sen (An Uncertain Glory: India and its Contradictions: Princeton University Press 2013) and Jagdish Bhagwati and Arvind Panagariya (India’s Tryst with Destiny: Collins Business 2012). Also of recent vintage is Ramachandra Guha’s work of modern history India After Gandhi (Harper Collins 2007). Another major event in scholarly accounts of India is Sunil Khilnani’s The Idea of India (Farrar, Straus and Giroux: 1998); and at least two notable assessments of India, since, have been the books by Satish Deshpande (Contemporary India: A Sociological View: Viking Penguin 2003) and Badri Raina (The Underside of Things: India and the World, A Citizen’s Miscellany, 2006-2011: Three Essays Collective 2012). Interest in post-Independence India – possibly with a long time-lag – was triggered by an early masterly work of humorous fiction, G. V. Desani’s classic All About H. Hatterr (Aldor Press: 1948), which was subsequently to be matched, if at all, only by Salman Rushdie’s Midnight’s Children (Jonathan Cape: 1980). The books mentioned above represent only a smattering of work on the subject of India. Small though the sample is, it brings into relief the wide variety of approaches to, and perspectives on, the subject which marks this genre of work. Many studies are governed by a disciplinary orientation, ranging over economics and sociology and history and political science. Others are non-academic, or less than explicitly academic, traversing the territories of fiction and belles-lettres and the essay. Some are adulatory of their subject, others fiercely critical, and yet others of the fence-sitting variety. While the West watches with a mixture of apprehension and anticipation (triggered respectively by India’s seeming emergence into economic consolidation and the prospect of a large and friendly market for the West’s goods and services), elite and upper-middle-class India marches on with what one could, from a certain perspective, view as increasing levels of assertive self-confidence, stridency, selfishness, and outright hubris. To the vast assortment of treatments of India already available, it is inevitable that parody should be waiting just round the corner — parody, let it be said, that is fuelled by involvement in and love of country, rather than by petulance toward it. Indian middle-man (to Author): Sir, there is no immediate demand for gestures. There is immediate demand for novels. Sir, we are literary agents not free agents. Desani had the advantage that All About H. Hatterr was a novel, apart from the fact that he was a great writer. Other literary gestures might prove much harder to classify, other than as gestures, pure and simple. As Desani observed, one problem with gestures is that they don’t necessarily have a great demand curve facing them — unless, of course, ‘India-watchers’, academic scholars, politically motivated readers, and people with a taste for parody should band together to falsify the proposition. S. Subramanian is an economist, and was, until recently, a professor at the Madras Institute of Development Studies in Chennai, India. 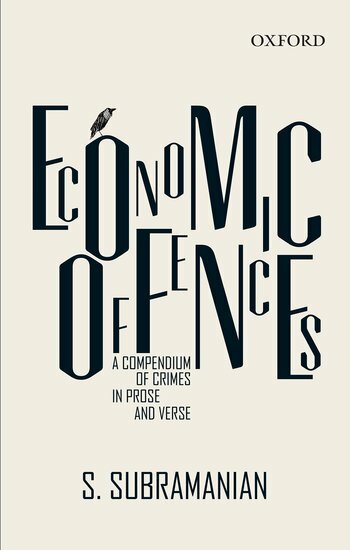 A National Fellow of the Indian Council of Social Science Research, he is the author of Economic Offences: A Compendium of Crimes in Prose and Verse. Subscribe to only economics articles on the OUPblog via email or RSS. 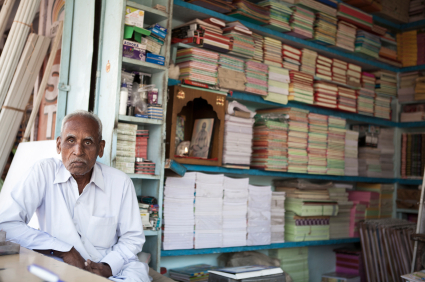 Image credit: Bundi, India, December 3, 2012: A senior Indian man with white hair and mustache, wearing a white shirt, is sitting in his bookstore looking to the camera. © isabel tiessen pastor via iStockphoto.